This is interesting question. Many marble floors have been crystallized to restore or prepare them for daily maintenance. When you clean marble floors and foot traffic wears the marble floor surface. Overtime this will cause the marble floor to be eventually restored again. Even marble floors that have been already treated with a crystallization process will need to be restored eventually. So this article’s purpose and goal is to outline the ways to restore a marble floor that has been previously crystallized. 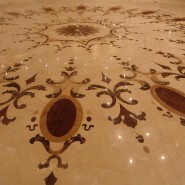 It will also answer the question if another restoring process can be used on a marble floor that has been crystallized. The short answer is yes. If you are interested in how to clean marble floors for commercial daily cleaning, please click on the link for a prior article written on this topic (Cleaning Marble Floors – Commercial–Steps for Daily Cleaning Unsealed Marble). All three methods have their own individual advantages and disadvantages. In every case to restore a damaged floor, grinding with diamond pads is required though top coating may allow you to forego this step if the floor isn’t in bad shape. A top coating can also be stripped off and crystallization done later. This is a good choice if quick results are required and if you do not have the time to perform a full restoration and crystallization process. Polishing: Polishing requires much more effort to bring the floor to an acceptable gloss level. To restore a damaged floor, polishing is worked with a series of small hard diamond-resin pads on the bottom of a rotary machine. These pads get progressively finer until a shine is achieved. This usually takes seven grinding steps and each step is extremely labor intensive but delivers a great look when completed correctly. Crystallizing: Crystallizing is a chemical process which will give a really high gloss. Typically a floor is polished as mentioned above but not to the same fineness then it is crystallized. The process of crystallization changes the surface of the marble and works synergistically with polishing to provide a high gloss and smooth surface. This method is also extremely labor intensive. But delivers a great look when completed correctly. Top Coating: Coating with a floor finish probably gives the least natural appearance and requires more general upkeep compared to the other two but also doesn’t require extensive restoration beforehand. You can just scrub and clean the floor followed by coating with a product suitable for a difficult surface to adhere to like marble. A floor finish and/or seal designed to be used on marble floors which are formulated to adhere specifically to marble floors is critical. This process is less labor intensive to restore the marble floors and the top coating floor finish and/or sealer will protect the marble floors. Coating also helps prevent stains and acid etching. The results will provide a high gloss with less initial labor. Combinations: Most products on the market, in a sense, are a combination of what is mentioned above. Many crystallization products come as a slurry or powder you make into a paste which contain an abrasive for polishing and include an acid for crystallization. In some cases these also include a waxy material which helps provide some sheen and offers some stain resistance. These types of products are used on a periodic basis and if used regularly the floor won’t need restoration for quite a long time. Using these types of combinations to restore a marble floor are more popular outside North America and far more common in South America and other parts of the world. On a more frequent basis, there are products used which can be classified more as maintainers. These products typically include acid for crystallization and a waxy material to help protect and give a improve gloss. These products are near water thin liquid and are buffed onto the floor much in the same way as a spray buff. These products can give good results if used a few times a week. For pure polishing there are pads on the market which contain an abrasive in the pad. 3M markets this type of pads. This is used on an auto scrubber during daily cleaning and helps to keep the floor polished. I think this product works the best with floors that only received polishing. We recommend if you have the budget and time to maintain a marble floor to use a periodic crystallization step followed by a buff with a maintainer product which contained a polymer floor wax material.